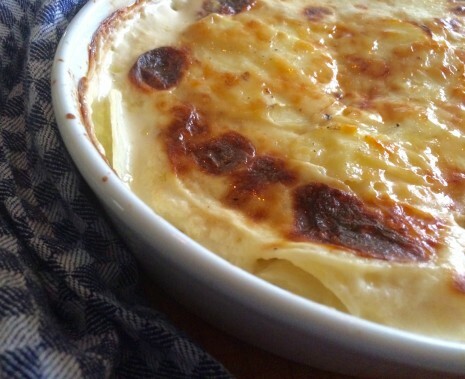 HIP POCKET RECIPE: SCALLOPED POTATOES | Jane Lear. Writing on Food and Travel. It’s officially Cozy Food season, and I just made one of my very favorite dishes in the genre—scalloped potatoes, or, if you’re in a more worldly frame of mind, gratin dauphinois. What I’m talking about is inexpensive and dead simple: thinly sliced potatoes saturated with creamy goodness and typically, if not traditionally, crowned by golden-brown cheese. It couldn’t be more basic. But it all adds up to far more than the sum of its parts. For starters, just the sight and aroma tend to rock people back on their heels, and it’s generally the first thing to disappear at a buffet supper or potluck. Because it swings from homey (meatloaf) to high-toned (standing rib roast) with aplomb, requires just a few ingredients, and embraces variation, the recipe will be traveling with me until the weather hottens up again and it’s not pitch-dark at a quarter to five in the afternoon. The recipe below was part of the collective culinary repertoire at Gourmet. The food editors—that’s what the cooks in the test kitchens were called—were tirelessly innovative and imaginative, but they also knew they stood on the shoulders of giants. They were not only generous, but scrupulous about giving credit where credit was due. As we noted in the big yellow Gourmet Cookbook, the genius behind this recipe is Jacques Pépin, whose technique of starting the potatoes in a saucepan of half-and-half is nothing short of life-changing. Not only do the starchy vegetable and the cream have a chance to get acquainted and intermingle a bit before they meet the heat of the oven, but the cook is spared the fuss of overlapping the potato slices and alternating them with the cream. Just tip the sludgy mixture (careful, it’s hot) into the baking dish, nudge the spuds into an even layer, and you’re good to go. Pretty much any kind of potato will work. Yukon Golds have fine flavor and their medium starch content results in a melting, melding texture. This time around, I used local Long Island white boiling potatoes; they were almost as yielding as Yukon Golds, but held their shape better. This morning I ran out and bought another five-pound sack. 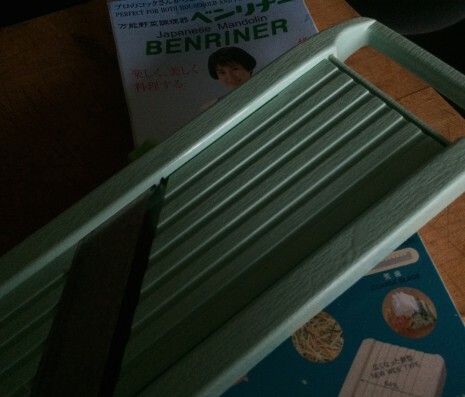 You can slice the potatoes by hand, obviously, but what really makes this recipe a snap is a Benriner, the Japanese handheld slicer. It’s made of sleek yet sturdy plastic and comes in an interesting array of pastels, but most importantly it’s cheaper and less intimidating than a bulky professional-style stainless-steel mandoline. I bought my “Little Beni” from the first American importer, J.B. Prince, years ago, and it’s still razor-sharp. Tips and tricks: If you don’t have time to mince the garlic, simply rub a split clove around inside the buttered dish. And don’t be chinchy with the cheese. Use a good-quality Gruyère—nutty, full-flavored, and just stringy enough—and plenty of it. Oh, and don’t forget the nutmeg. The tiniest amount is the secret ingredient that prevents many a creamy sauce from tasting flat and stodgy. You’ll miss it if it’s not there. Variations on a theme: A potato gratin is endlessly accommodating. Try cutting the spuds with another root vegetable such as turnip, rutabaga, parsnip, or my personal favorite, celery root. Leeks, sweated in butter until lissome, are another nice addition, as are nubbins of cubed ham, pancetta, or bacon. In other words, have fun. And thank you, Jacques. This gratin may be made a day ahead, cooled completely, then refrigerated, covered. Bring it to room temperature before reheating, covered, in a 350° oven. Any leftovers (if you should be so lucky) are delicious with a fried egg on top. 1. Put a rack in the middle of the oven and preheat oven to 400°. Generously butter a 2½- to 3-quart gratin dish or other shallow baking dish. 2. Peel the potatoes. Cut them crosswise into 1/16-inch-thick slices with the slicer and put them in a 4-quart heavy saucepan. Stir in the half-and-half, garlic, salt, and pepper and bring just to a boil over moderate heat. 3. Pour the potato mixture into the buttered dish, distributing the potatoes evenly. Sprinkle the nutmeg and cheese evenly over the top. Bake until the potatoes are tender and the top is golden brown, 35 to 45 minutes. Let stand for 10 or 15 minutes before serving.